Comment: firstly I decided to use Scott Lawlor`s title version on Bandcamp because Wings of an Angel`s version is way too long for the row of the title (Lo And Behold Ye Confirmed Minister Of War, The Olympian Falcon, Galloping Away Like A Humiliated Homer, You Were The Perfect Ripper In The Backdoors Of London, Before You Had Found Your Forepleasures In The Subdefinitions Of The Prowling, Censorious, Nutcrackers Of The Kitchen). It is massive and profound, isn't? Indeed, it is a joint release by the Israeli and US-based musician both of them are well known within the circles of experimental music. Wings of an Angel is probably the most prolific artist at the moment worldwide and Scott Lawlor is also being known as the lead figure of Earth Mantra netlabel. By listening to these 54 minutes I tried to guess whether is it the measured midway between the aesthetics of the two artists or is it something absolutely qualitatively new created by them? Indeed, the track is lengthy (yet not drawn-out) so it can be said the both aspects are really true. 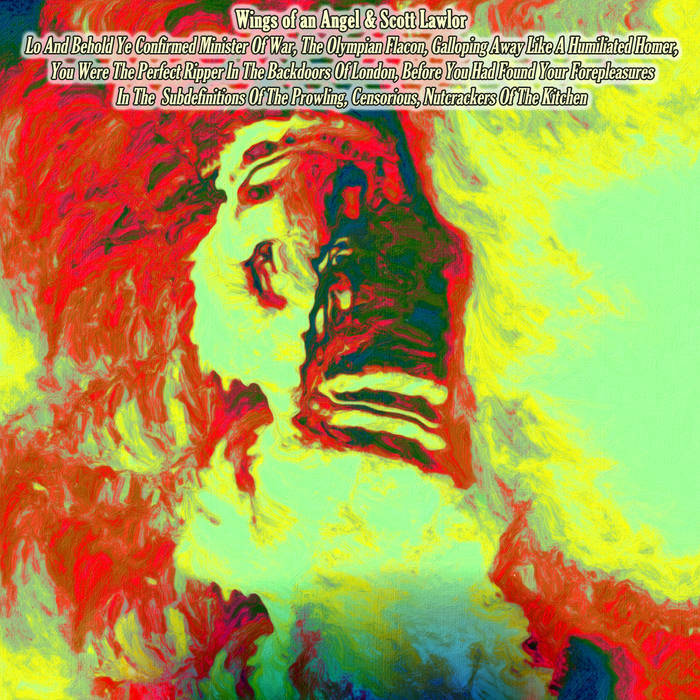 For sure, it does away with modern/post/contemporary classical progressions which is an important part in the aesthetics of Wings of an Angel but on the other side the Israeli juggernaut`s ambient touch is bound tightly with the US-artist`s abstract droning and austere ambient/sound art appearance. Furthermore, you can hear as if all the sounds were produced on nearby a custom-made saw mill as if all the sounds were processed through restrained sonic channels and then the erroneous result were cranked up to a maximal volume bar. Indeed, the result is very tight and abrasive yet it is not an obnoxious noise release. Because of arousing majestic and epic feelings in the listener I have to admit it is a fairly exquisite issue on its own. You will be bludgeoned and caressed at the same time. It might be even more an epitome of ruining the contemporary civilization by throwing the stones into its clockwork. It might be the sound of the collapsing one. It may also be a synonym of the human being`s greediness asi if experiencing the feel of ingurgitation. Get the newest technical applications and cell phones to your home and into your pocket, respectively! Eat yourself fitter! The second part of the track/composition/album seems to be chiming as if just moving on inertially. But you know one`s perception starts to play mischievous tricks on his/her mind while listening to such a sort of tight soundscape. And now while listening to this great one just try to decipher the point of the title.